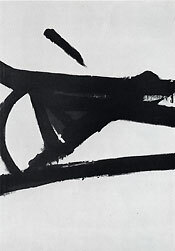 The following material is from 12 Americans, published by The Museum of Modern Art in May 1956 in association with its ongoing series of group exhibitions of work by contemporary American artists. 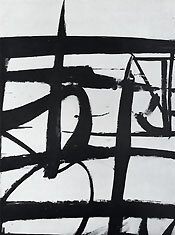 In a period of self-conscious styles, of statements modified, qualified, organized and carefully bolstered, one finds a large ease and authority in Kline's manner of painting. The tough masculine thrust present in every scraped surface and bruising brush stroke reveals nothing of theory or dogma. 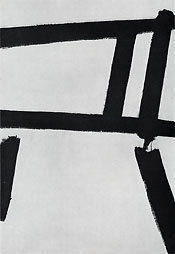 The reality created here has the blunt, dazing immediacy of a personal experience--the kind of experience one generally doesn't pay attention to, like a ride in the subway. . . .
Stark and instantaneous in effect, Kline's compositions are not at rest. Their balance is not classically internal. Each picture directs its energy outward, but never explosively. The outward motion is controlled, channeled, motorized. One feels in the spreading black shapes a curious sense of threat. Forthrightness seems carried to the point of brutality as these images reach out and seize the physical space of the room in which they hang. The heavy, black flank in Chief seems to pour a shaft of darkness over the wall on its right; the imprisoning crossbars and spikes of Cardinal drive upward while the overhanging, iron-black construction of High Street is about to veer forward--the force everywhere is aggressive. 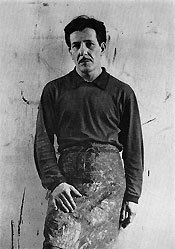 The artist himself, however, sees these structures as personages--not menacing ones but playful or gentle or lost--and his interpretations are as logical as anyone's.